Tomo's Japanese kitchen: Happy Sunday - girly brunch, dinner & crazy shopping! Happy Sunday - girly brunch, dinner & crazy shopping! I caught up with my good Japanese friend today. We used to meet up almost every weekend but I hadn't seen her for about a month! I was busy with work and settling down at my new place and she was overseas for a week. It was raining so so heavily like really pouring this morning but we managed to get out of the house and met up at Far East Plaza. I sometimes go there for lunch with my colleagues but it was my first time meeting up with my Japanese friend there. She told me that there is a nice yakitori place called "Nanbantei". I had been there once but couldn't remember what it was like and felt like going back there so we did. Price is reasonable and food was not bad. People were friendly especially after they found out that we were Japanese. Singaporean waitresses tried to speak Japanese to us and that was really sweet. I was so hungry that I forgot to take a picture of the food but we both ordered yakitori bento and it was good. SGD 13++ and came with miso soup and red bean dessert too. We talked, talked and talked for about 2 hours - about work, holiday, food, fashion, family, friends, japan, everything, basically updating each other on what we've been doing for the past 1 month. Then one of the waitresses came to us and said the shop was closing. We looked around and realized that most of the customers had already left the shop. It was close to 3 pm. Whenever we meet up, we always forget time and talk so much. After that weather was kind of getting better (pouting to drizzling) so we moved to ion and started our crazy shopping. What is crazy about our shopping is that it's not about the amount of money we spend or things we buy. It's the time we spend at each shop, trying out many clothes, discussing and commenting on each other's outfits, taking time to decide what to buy and what not to buy. Boys might find this process of shopping "wast of time", but actually I find this the most fun part of shopping. Even some girls can't take shopping with other indecisive girls but we are both indecisive and we enjoy giving advice to each other and wait till your indecisive shopping buddy finally makes her decision with a happy face! We talked, laughed, shopped and ate so much and I'm so fully charged from work fatigue & everyday stress! I haven't felt this way for so long and am actually happy to start Monday again! Many thanks to my friend for her positive energy. I was very happy to converse her in Japanese too. 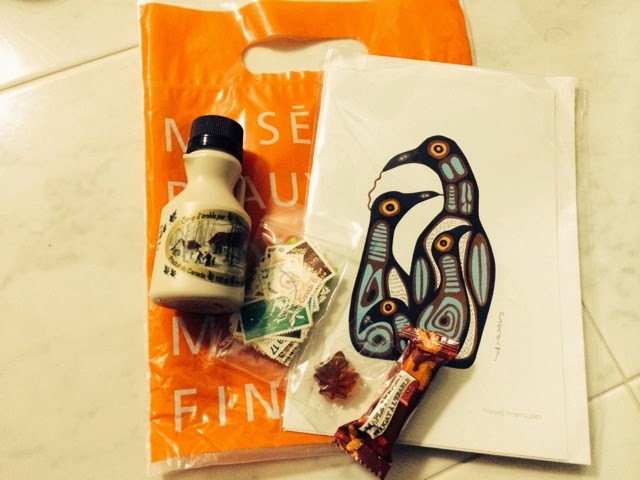 The below picture is the souvenirs from Canada that she got for me. Thanks so much for the lovely gifts & happy Sunday!